What more could be said about oysters, and why they are the perfect Ingredient of the Week? For New Yorkers, the case for slurping Crassostrea virginica—not just during Eat Drink Local week, but year round–is historical, economic, ecological, cultural, as well as gastronomic. It’s no surprise that of all our Seven Ingredients, oysters were embraced by nearly every Eat Drink Local chef from Manhattan to Montauk, including the North Fork Cornell Oysters with cucumber and mint mignonette at Fresno Restaurant in East Hampton (many partners, like Elsewhere in Hells Kitchen, opted for a strawberry-chive mignonette), the Island Creek Oysters in a green garlic broth at Gramercy Tavern, and the crispy Bluepoint oysters with Liberty Farms pea shoot salad with chive remoulade at James in Prospect Heights. 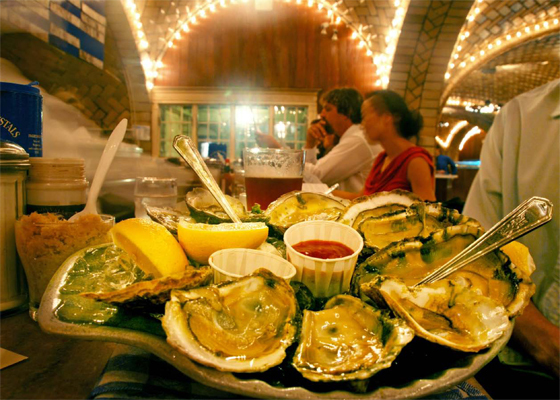 Whether at the Grand Central Oyster Bar or at our partner restaurant menus, local oysters are abundant. Photo by Edible Manhattan, Brooklyn and East End publisher Stephen Munshin. A couple of years back, Rowan Jacobson, author of the James Beard Award winning A Geography of Oysters, took an oyster sleuthing tour for Edible East End of the latest generation of men and women who are raising the mollusks in the Peconic Bay and Long Island Sound. The result was a snapshot map of the “Oysters of Long Island.” Jacobsen’s story includes some incredible history, including the story of the rise and fall of the still-ubiquitous Bluepoint oyster. The name, Bluepoint, migrated from the Great South Bay (after the collapse of what was once “a 23-mile uberbed”!) to Long Island Sound and even up and down the East Coast, to the chagrin of Long Island oystermen. 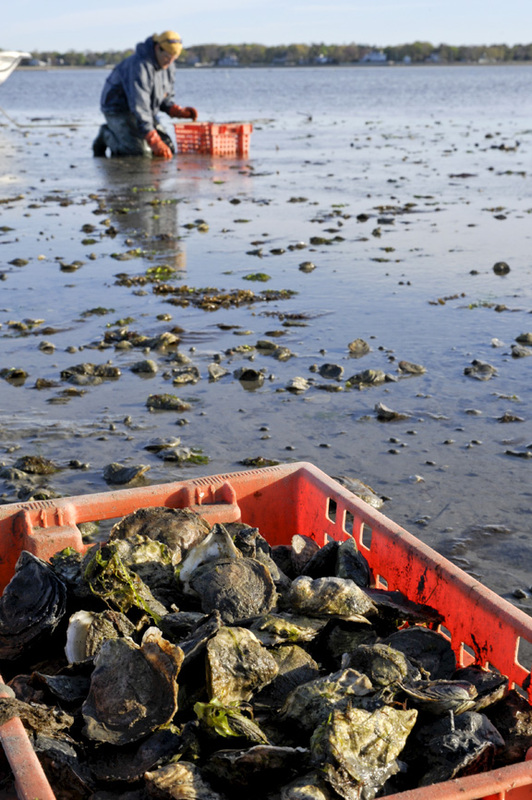 Today, Frank M. Flower and Sons is one of the primary suppliers of true Bluepoints, harvested mostly around Oyster Bay. 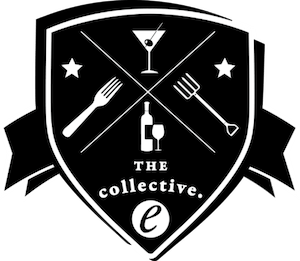 To see the special menus incorporating this and the six other Ingredients of the Week that were created by our partner restaurants, check out our Eat Drink Local restaurant guide. Despite the fact that oysters come raw, grilled, cooked in soup, baked in pies and stuffing, and in an endless range of other delicious incarnations (see our restaurant partner menus for proof), there are those refuse to eat them. When the plate of just-shucked ollies are passed around, there are some people who will pass. We aren’t the type to judge, but we will argue that such aversion is purely subjective and based in personal squeamishness, rather than any rational concern about the safety of oysters. 4) When in doubt, refrigerate the raw oysters overnight (which should kill any harmful microbes) or simply cook them.